The War of 1812 began when the United States declared war on Britain on June 18, 1812. The United States' main reason for a renewed war with Britain was the continuing impressments of American sailors overseas. The British, also at war with Napoleon's France had been interfering with American trade and pressing Americans into service. By 1814, England had defeated Napoleon and had turned their attention to American shores. The city of Baltimore would prove to be a major focal point in the War of 1812. On September 12, 1814 over 4,000 British troops landed at North Point, Maryland. The plan devised by the British was to march towards the City of Baltimore and to capture the port city. The British had already captured and devastatingly burned the nation's capital, Washington D. C. in late August. The British were hoping to repeat their success in Washington with a similar attack on Baltimore. At 3:00 A.M. on September 12, the campaign officially began. Under the command of Major General Robert Ross, troops and supplies were unloaded upon the Maryland shore at North Point. Meanwhile, as part of a land and sea two prong attack, British ships had also entered the mouth of the Baltimore Harbor near Fort McHenry. A rather small force of just over 250 Maryland volunteers, led by Brig. Gen. John Stricker, commander of the 3d Brigade of the Maryland militia met the marching British troops at North Point in an attempt to delay the British advance towards Baltimore. For over two hours, fighting ensued between the outnumbered Maryland volunteers and the highly trained British infantry. Most notably, two Marylanders, Private Daniel Wells and Private Henry G. McComas were credited with purportedly killing Major General Ross, which proved to be a major blow to British hopes for victory. Unfortunately, both Wells and McComas would also be killed later that day. It has been historically debated whether these two men were the actual sharpshooters that felled Ross. The debate continues in academic circles to this day. British command passed to Col. Arthur Brooke, who continued to move the troops toward the city. After the Battle of North Point, the British march to Baltimore was obstructed by a force of 10,000 Americans on Hampstead Hill. Ultimately, the British failed in capturing Baltimore. The land attack failed and Fort McHenry withstood the heavy British bombardment by sea. Francis Scott Key watched the proceedings at the fort and wrote the words to the Star Spangled Banner, which eventually became the U.S. National Anthem. 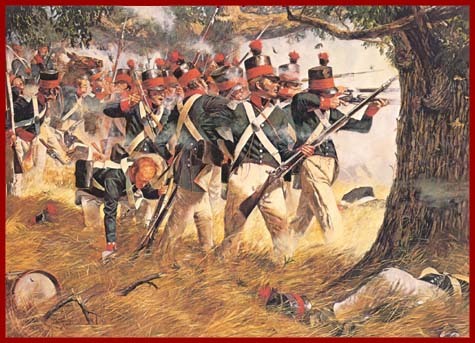 The Battles of North Point and Baltimore had all but vanquished any hopes of British victory in the War of 1812. With these battle victories, the War of 1812 had reached its turning point and of victory over the British was imminent. Standard 3D: The student understands the interactions among all these groups throughout the history of his or her state. SOURCE FOR IMAGE: Wikipedia. Original painting owned by the Maryland Historical Society. NOTES: This website was designed to attract would-be re-enactors/ However, there is a Ruckle painting available for viewing as well as a picture of an 1812 uniform in addition to the engraving listed above. NOTES: A 19th century source on the War of 1812 with illustrations and pictures by Lossing. This was perhaps the first attempt at a comprehensive history of that war for it was written in 1868 and published in 1869. Some of the people who talked to Lossing about the war had been participants in the battles. SOURCE: Naval Register: Printed by Order of the Secretary of the Navy, August 1st, 1815. Washington, D.C.: Weightman, 1815. NOTES: This illustration does not have a date. It is most probable that it is a more contemporary illustration of the Major General. Yet an absence of available portraits or paintings make this illustration valuable to the researcher. TITLE: The Citizen Soldiers at North Point and Fort McHenry, September 12 & 13, 1814. Resolves of the Citizens in Town Meeting, Particulars Relating to the Battle, Official Correspondence and Honorable Discharge of Troops. Also Celebration of the Seventy-Fifth Anniversary, 1889. General Society of the War of 1812. Other 1812 Links, 2012. Maryland State Archives. The Whisky Rebellion, the War with France, and the War of 1812. NOTES: This webpage includes information on how to obtain primary sources that are related to the War of 1812 from the National Archives and Records Administration as well as a select bibliography on articles and sources available in the Archives mostly in the Reference section of the building. TURNING POINT IN HISTORY: The War of 1812 Should it be called the Second War of American Independence? The Star-Spangled Banner: Fact or Fiction? From the UMBC Center for History Education. Brugger, Robert. "Realizing the New Republic (1781-1815)." In Maryland: A Middle Temperament. Baltimore: The Johns Hopkins University Press in association with the Maryland Historical Society, 1988. Colston, Frederick Morgan. The Battle of North Point: The bombardment of For McHenry, and the Birth of "The Star-Spangled Banner". Baltimore: J. H. Furst Company, 1907. Darling, Carlos Parsons, B. L. A Sketch of the principal Events of the War of 1812. 2000. Echols, C.H., The Battle of North Point in The Dundalk Eagle, 2003. Lossing, Benson J. "Baltimore and Washington (War of 1812)" Harper's New Monthly Magazine (March 1864):433-449. Marine, William Matthew. The Battle of North Point. Baltimore, Hanzsche & Co, 1901. Miller, John. The Short History of Defense of Maryland During the War of 1812. From Emmittsburg Area Historical Society, 2003. Spaulding, Thomas Marshal. The Battle of North Point. In Sewanee Review, July 1914, p. 319-328. Tawes, J. Millard. Address, General Society Of The War Of 1812, Defender's Day, Fort McHenry. In Executive Records, Governor J. Millard Tawes, 1959-1967. Archives of Maryland Online, 13 September, 1959, p. 353-355. Whitehorne, Joseph A. The Battle for Baltimore, 1814, The Nautical & Aviation Publishing Company of America, 1997. This document packet was researched and developed by Michael Walsh.